Lucia di Lammermoor has many wonderful aspects, whether it’s the Romeo-and-Juliet-esque star-crossed lovers with Edgardo and Lucia or the breathtaking sextet with all of the voices coming together to create one of the most memorable tunes in opera. Of course, the real reason we go to a performance of Lucia is the mad scene; that divine moment (all 16 minutes of it) when the soprano gets to show off all the vocal fireworks and stunning coloratura that we’ve come to scrutinize under the closest of microscopes. The singer must have all the goods as a singer AND as an actress—no small feat. One of the great joys of opera is revisiting a piece and hearing different singers interpret a role in very different ways. Today we’re putting you in the shoes of a General Director by auditioning three famous sopranos singing the most recognizable moment of the mad scene, the famous so-called "battle with the flute," and then voting for your favorite. This is the moment when Lucia, who has murdered her new husband, comes back on stage to interrupt the chorus's party with her hallucination that she and Edgardo are now happily married. In this scene, Donizetti eliminates the orchestra and has Lucia sing with a solo instrument (usually that aforementioned flute, but originally scored for a glass harmonica). This is the apex of bel canto madness; a lone woman, singing unaccompanied, confused and heartbroken. It may sound like the most beautiful music you’ve ever heard, but in this moment the audience shares the experience of a woman having a complete breakdown. Our first soprano is none other than Maria Callas (1923-1977), a woman who almost single-handedly revived the style of bel canto opera. Here was a singer who colored every word that she sang with deep meaning. It’s not always the most beautiful sound, but it manages to convey the emotional torment that Lucia is suffering. 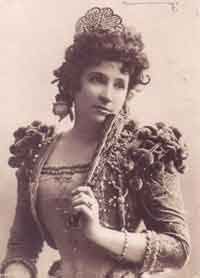 Our second soprano is from an early era, the famous Nellie Melba (1861-1931). These days she’s probably more remembered for the toast or the peach dessert named for her, but Melba was without a doubt one of the most recognized voices of her time. She has a very different sound than our first soprano; it’s lighter, perhaps conveying the innocence of the young Lucia. 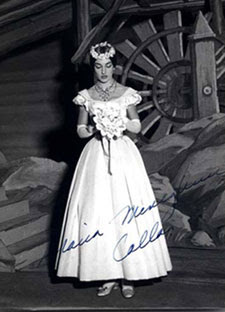 It’s also important to remember that prior to Maria Callas, Lucia was little more than a way for a performer to show off her vocal skills. Only later did directors and singers impose on the opera a deeper sense of psychological drama. Our third and final soprano is Beverly Sills (1929-2007), who sang the role of Lucia at Seattle Opera in 1972. In her voice we hear the vocal nimbleness that can make bel canto so exciting. Again, she sounds as if her life has been sheltered and this is the first time she’s experienced such grief, unlike Ms. Callas who sounds as if she has lived through this experience of heartbreak once or twice before. In this recording, Ms. Sills is accompanied by the glass harmonica instead of the flute. Does this change the tone of the scene for you? Any of these singers would be a wonderful choice for Lucia, but since this is an opera loosely based on Scotland and Highlander stories, I should say: “There can only be one!” It’s your turn to vote for your favorite and tell us who you would want to see and why.